Nova Ultra Cushion - L&M Distribution Inc.
Ultracushion® is Nova Sports’ ultimate acrylic shock absorbing surface. A combination of virgin EPDM rubber granules encapsulated in high solid elastomeric (soft and flexible) acrylic binders enable the Ultracushion®system to provide the highest level of comfort. 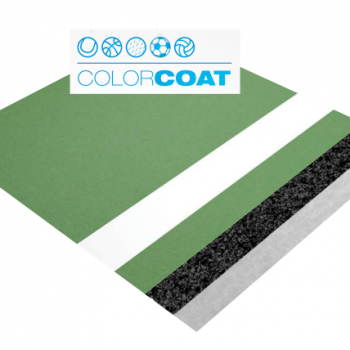 The shock absorbing qualities are achieved by a base consisting of multiple applications of ULTRACUSHION® followed by a minimum of three fine rubber Novacushion® coats. Two to three coats of COMBINATION SURFACE® are applied over the cushion surface providing a uniform texture and attractive color finish without decreasing the comfort of the cushion system. The surface has the ability to absorb the shock of impact and will return the energy absorbed by the tennis ball. Players have reported that they are less fatigued after playing on ULTRACUSHION. The system’s superior level of cushioning combined with the Combination Surface® top coat provide players a unique low abrasive texture reducing wear on shoes, balls and more importantly your body. This all-weather system retains the low maintenance, durable features found with all Novacrylic surfaces and is ideal for both indoor and outdoor use. Ultracushion is not hazardous* and is free of lead, mercury, asbestos and formaldehyde.